ClockShark's facial recognition technology is a powerful tool available to your company which snaps a photo of your employees when they clock in for work, and embeds the picture in their timesheet. Note: Photo capture is only available for KioskClock at the moment. 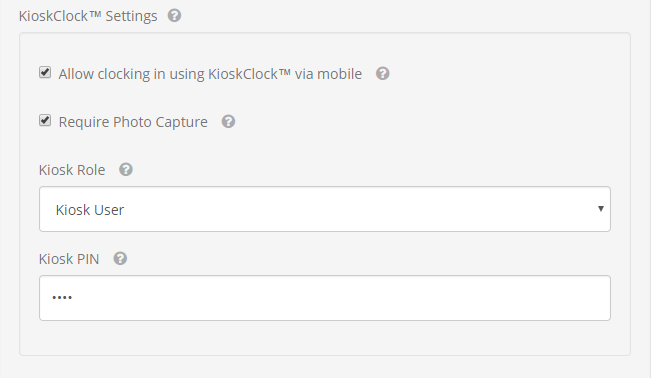 If you'd like to see facial recognition added to ALL of ClockShark's time tracking tools, please let us know. To enable the photo capture setting, navigate to Admin > Employees. Click the pen icon to edit a specific employee. 4. Create a PIN for the employee to use at the KioskClock. 5. Scroll down and click the "Update Employee" button. In the Timesheets > View Timesheets screen, you will see the employee's picture beside their clock-in time. You will also see an error alert if the wrong employee's face is captured. 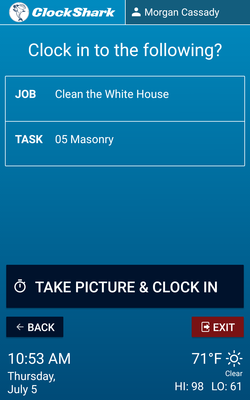 You Can Be Picky: Like Manager Permissions, photo capture is enabled on an employee-by-employee basis. You get to choose which employees are on candid camera, and which ones aren't. You are all set to begin using photo capture for your company! You can read more about KioskClock here.